Building Form with Multiple Events. Using a Number of Logical Conditions or Separating them as Forms? I have created repeating fields and conditional logic to display so many fields, subject to the quantity of golfers entered (up to 32). I intend to replicate this logic (perhaps with some slight variations in field content) for a number of events as listed in the Dropdown list. Do you think I will hit any speed or other limitations once the form is completed for approximately 15 events? If so, am I better of creating 15 different forms and conditionally hyperlinking to each (I'm not even sure if this is possible), subject to the choice in the Dropdown list? I'm not sure if you'll hit a limitation. We have users who have long forms and have multiple fields, other fields like drop down can extend to a thousand entries. What I can suggest is that you try a combination of form collapses and page breaks to separate your form by sections. It's best to not load all the fields in one page, as this will take a lot of processing time on the user's web browser. You can also use this widget to add a tab effect, http://widgets.jotform.com/widget/form_tabs. For the Conditions, I believe as long as they do not conflict to one another, they will work as expected. It is possible to somehow connect forms to each other, this is through prepopulating them, you can get a glimpse of it here: http://www.jotform.com/help/71-Prepopulating-the-fields-to-your-JotForm-via-URL-parameters. Having 15 forms to work on may be a little too confusing, unlike working on one form, although it would be hard to track down all the changes when you put them all in one place. 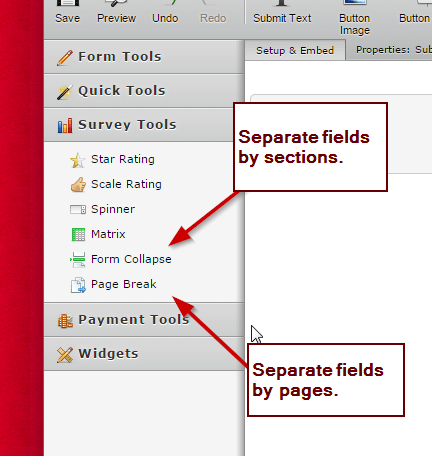 If you could use form collapse, page breaks and using multiple forms literally, that would make the forms load faster. If you need more assistance on this, feel free to open up a new thread. I will see how this all pans out. Regarding Page Breaks, it would be handy if I could hide the Next and Previous buttons (and the same might be the case for the Form Tabs Widget) so that other pages are effectively not able to be seen or accessed by the user and so that only conditional logic can manage movement to specific pages. You can just disregard the Form Tabs if you would like to hide other pages. 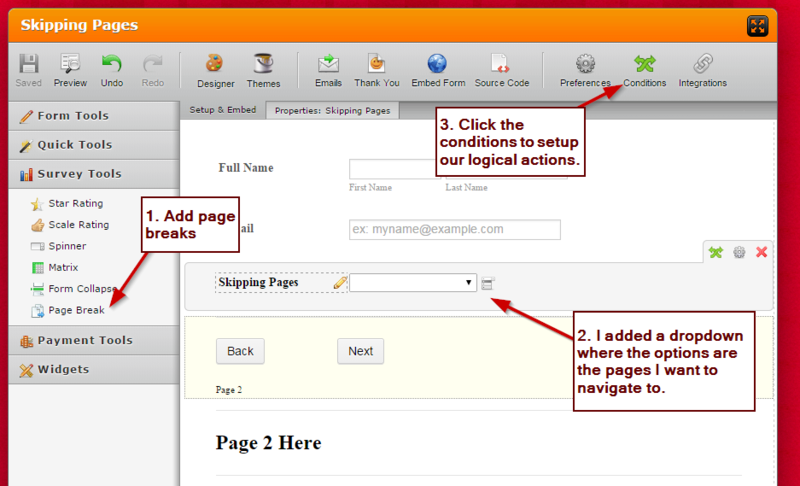 In the case of hiding pages and skipping parts of it, yes it is possible using the Conditions setup. I made a simple skipping page setup below. 1. I've setup a sample form here. With 4 pages and a drop down field with a condition to choose what page to navigate to. 2. 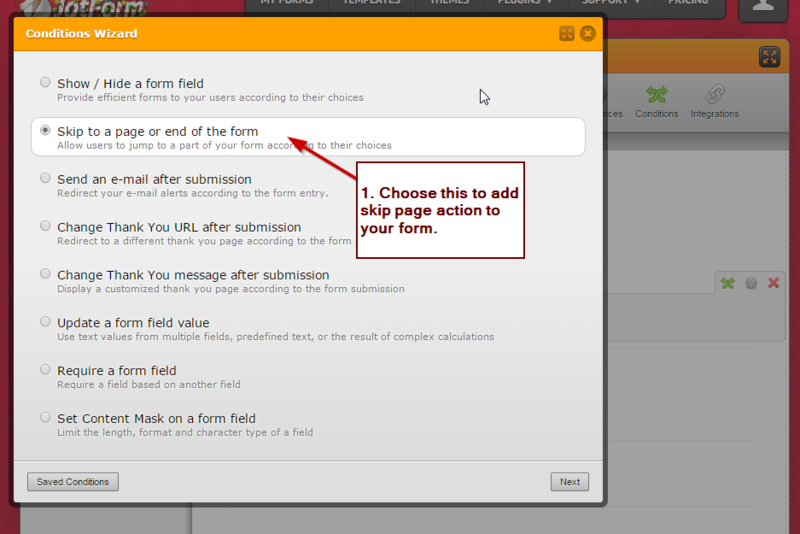 Click the Conditions and Choose "Skip to a Page or end of the Form". 3. Here's a sample rule and action for my form. 4. And here's the rest of them. 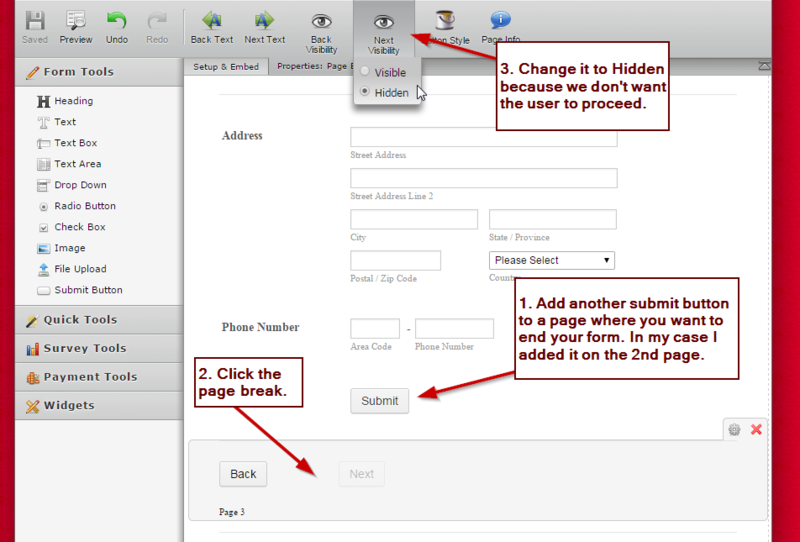 If you would like a specific page to be the ending part of your form, we can add multiple submit buttons on them and disable or hide the next button of that specific page. I hope this helps. Let us know if you need more assistance on this.